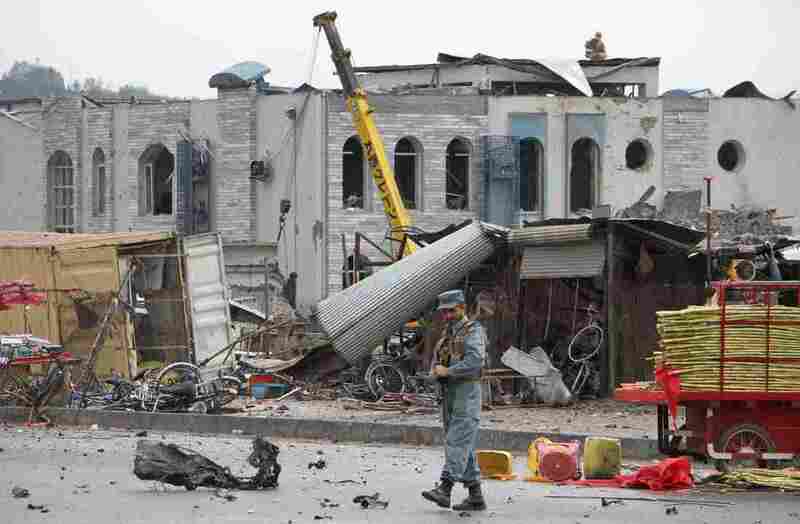 Kabul Attack Kills Dozens, Wounds Hundreds; Taliban Claim Responsibility : The Two-Way A suicide car bombing was followed by an attack staged by gunmen. The attack hit during morning rush hour; the wounded included women and children, Afghan officials say. 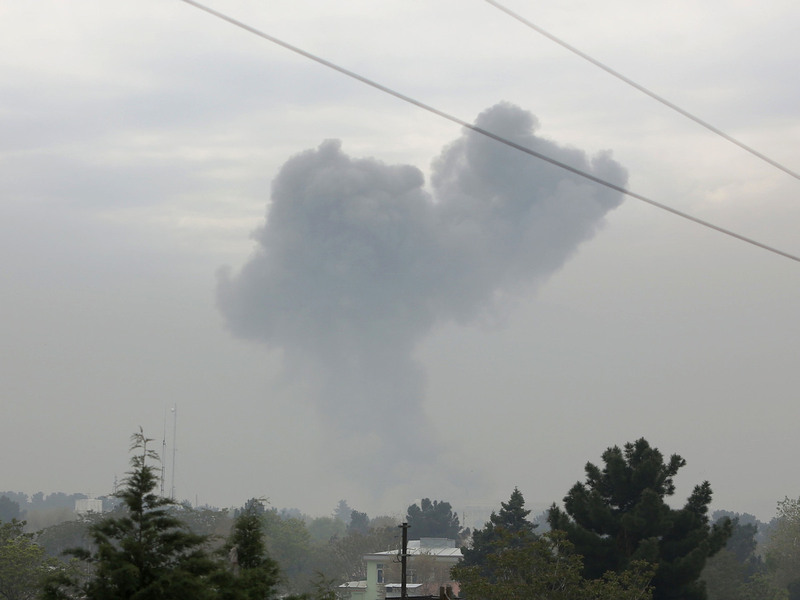 Smoke rises after a suicide attack in Kabul, Afghanistan, Tuesday. At least 28 people have been killed and more than 320 wounded in an attack in Kabul. The assault targeted a key government security agency and included a suicide car bombing and an offensive by armed militants. The Taliban has claimed responsibility. The attack hit at about 9 a.m. local time, during morning rush hour — one reason there are so many casualties, NPR's Philip Reeves reports. It comes about a week after the Taliban announced the start of their spring offensive. Philip says the explosion, which he described as an unusually big detonation, could be heard across the city. After the loud blast, a huge cloud of dust and smoke — hundreds of feet high — rose above the city, Philip says. "It was followed by the sound of a prolonged gun fight. Ambulance sirens intermittently echoed through the streets for hours afterwards," he says. He notes that Kabul is one of the world's most heavily fortified cities, and yet the suicide bomber managed to travel to the center of the city and detonate a bomb. "Threat of attack has already turned this capital into a cluster of forts, wrapped up in razor wire and concrete blast barriers, patrolled by a multitude of hard-faced men with guns. These days, when they cross town, senior Afghan and international officials often use helicopters as taxis, rather than run the risk of being shot or bombed while sitting in a traffic jam," Philip says. "It's hard to know how you make this place any more secure." Afghan policemen keep guard at the site of the Taliban attack in front of Afghan intelligence office in Kabul, Afghanistan on Tuesday. The Taliban said on their website that the assault targeted "Department 10," a security unit that protects government ministers and other high-ranking officials. They claim a suicide car bomber blew up the main gate at the front office, which allowed other fighters to enter the heavily guarded compound. As the BBC writes, "The Taliban has over the past year enjoyed a resurgence, buoyed by the withdrawal of most NATO and U.S. forces at the end of 2014, and a flood of foreign fighters joining their ranks. It now controls sizable parts of Afghanistan." President Ashraf Ghani condemned the attack "in the strongest possible terms," and said that it "clearly shows the enemy's defeat in face-to-face battle with Afghan security forces." Public Health Ministry spokesman Ismail Kawasi said the wounded include women and children, who have been brought to area hospitals.